Divorces are uniquely personal forms of litigation. Rarely do we subject such personal matters as the success or failure of our most intimate relationships to public scrutiny, and doing so can be painful. Along these lines, some parties to a divorce may feel tempted to ignore or avoid dealing with the divorce case, due to the stress or sadness that the case brings. However, hiding from the problem doesn’t only not solve it; this sort of avoidance can result in a permanent loss of the chance to assert your rights before the court. Additionally, attempting to mislead the court regarding whether or not you knew about the divorce can be extra costly. A recent New Jersey Appellate Division opinion addressed a case where a spouse failed to act in time to prevent a decision from becoming final. The couple at the center of the case, titled Mora v. Mora, had been married once before, but divorced in 1979. Their second marriage began in 1988, and in 2014, the husband filed for divorce. At that time, the wife asked her husband to provide her with an attorney. The husband served the complaint for divorce on the couple’s 23-year-old son, who lived with the wife. Months later, the husband drafted a proposed final judgment of divorce (FJOD), dividing up the couple’s business interests and properties, including allocating several properties to the wife as sources of rental income. The husband requested a hearing on the FJOD and notified the wife several times of this hearing. The wife did not respond to these notices and did not file any opposition to the proposed FJOD. The wife attended the hearing and was offered the services of a Spanish-to-English interpreter. She was provided with a chance to speak and participate in the hearing, but she did not. The proposed FJOD became the FJOD after that hearing. Months after the divorce was made final, the wife sought to vacate the FJOD entered by default, claiming that she did not receive adequate notice of the divorce, that the FJOD hearing had been confusing, that her husband’s attorney had a conflict of interest, that she deserved an opportunity to request alimony, and that she found the division of assets in the FJOD to be unfair. The trial court rejected her request, and the Appellate Division affirmed this decision. When a defendant fails to respond on time to legal claims filed against them, the court will typically grant the outcome sought by the plaintiff. This is called a “default judgment,” since the plaintiff wins by default. Some defendants default for good reasons, such as not having received proper notice of the lawsuit, or because of difficulties with their attorney. Courts are often generous in allowing litigants another opportunity to respond to a complaint filed against them by vacating a default, which will allow the defendant to participate in a trial on the merits of the plaintiff’s claims. In examining the wife’s claims, the court found that many of the reasons she had cited for vacating the default were unsubstantiated or simply untrue. 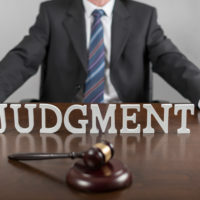 While the wife claimed not to have known about the divorce, the husband presented evidence that their son had been served with the divorce papers, and that since she had asked about being provided with an attorney years before, she was clearly aware that the divorce was pending. The court’s opinion went on to explain that, during the hearing on the FJOD, the judge had asked the wife if she had any questions or issues with the FJOD, but she had declined to speak in the hearing aside from complaining about a lack of alimony and the “pittance salary” provided for in the FJOD. The court found no support for any conflict of interest on behalf of her husband’s attorney. Essentially, the court concluded that the wife had more than enough time to file an opposition to the FJOD crafted by her husband, that she had ample opportunity to speak up in the hearing on the FJOD, and that there was no good reason to upset the long-finalized decision. If you need assistance with a matter pending before the family court in New Jersey, contact the knowledgeable, seasoned, and compassionate Union family law attorney John B. D’Alessandro for a consultation, at 908-964-0102.